HP Umpire John Tumpane ejected Cubs LF Kyle Schwarber (strike three call; QOCY) in the top of the 7th inning of the Cubs-Reds game. With two out and two on (R1, R2), Schwarber took a 2-2 fastball from Reds pitcher David Hernandez for a called third strike. Replays indicate the pitch was located over the inner half of home plate and below the midpoint (px .386, pz 3.511 [sz_top 3.371 / MOE 3.454 / RAD 3.579]), the call was correct. * At the time of the ejection, the Cubs were leading, 6-1. The Cubs ultimately won the contest, 6-1. This is John Tumpane (74)'s first ejection of 2018. John Tumpane now has 6 points in the UEFL Standings (2 Prev + 2 MLB + 2 Correct Call = 6). *This pitch was located 0.81 vertical inches from being deemed an incorrect call. *A strike is a pitch which "Is not struck at, if any part of the ball passes through any part of the strike zone." This is the 43rd ejection of the 2018 MLB regular season. This is the 22nd player ejection of 2018. Prior to ejection, Schwarber was 2-4 (HR, 2 SO) in the contest. This is Chicago's 3rd ejection of 2018, 1st in the NL Central (CHC 3; MIL 2; PIT 1; CIN, STL 0). 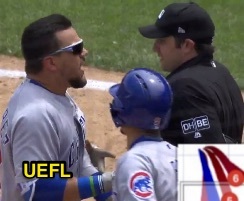 This is Kyle Schwarber's first career MLB ejection. This is John Tumpane's first ejection since August 20, 2017 (Torey Lovullo; QOC = U [Warnings]).